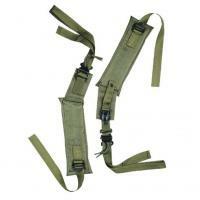 The GI SPEC LC-II ALICE Shoulder Straps from Tru-Spec are an exact copy of the ones used by the U.S. military. They attach to the ALICE pack frame, making it convenient to carry around. They are made from heavyweight ballistic nylon, which is highly resistant to wear and tearing and also strong enough to support a fully loaded pack with ease. It comes with equally tough metal hardware, ensuring that there are no weak links. The straps are adjustable, allowing you to find the length that optimizes load distribution and ensures a comfortable, movement-free fit.